End-users and investors in Dubai have never had it this easy to purchase property. Danube Properties is targeting both buyer segments with its 10th project – Jewelz – in Arjan with its 1 per cent monthly payment plan and 15 per cent rental guarantee. The Jewelz project comprises 463 fully furnished units and has an estimated project value of Dh300 million. The average price per sqft at the property is approximately Dh1,000. A studio at Jewelz costs Dh465,000, 1-bed is Dh750,000 and a 2-bed comes for Dh1 million. “Pay 46 per cent until handover and take your keys. A studio rents for Dh42,000 in Arjan. So, an investor can pay the remaining amount through rental proceeds and get a RoI of approximately 16.8 per cent,” said Atif Rahman, director and partner, Danube Properties. The property will charge owners a service fee of Dh12 to Dh14 per sqft. However, the developer will only buy another plot once it has achieved sales in excess of 70 to 80 per cent on its new project. “We have a conservative approach to development. We don’t want to be overly aggressive,” added Sajan. Danube’s high-rise in Business Bay, Bayz, is 95 per cent sold out, said executives. 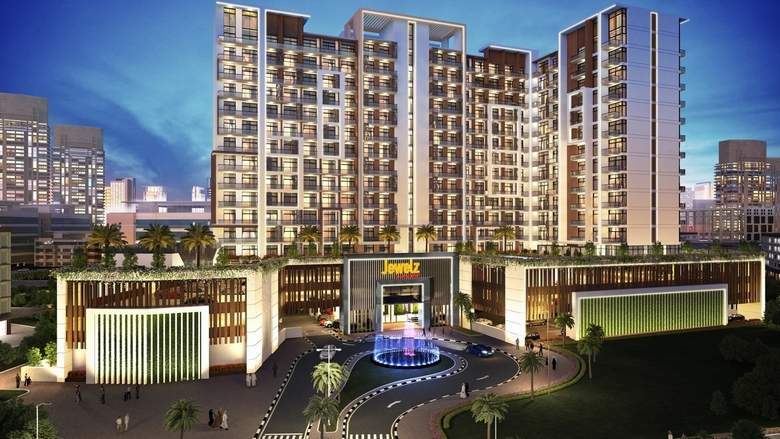 With Jewelz, Danube Properties’ development portfolio will be worth Dh3.3 billion. The developer has sold around 1,000 units in its earlier projects launched in Arjan – more properties than in any other community. “Arjan is a fully developed community where 90 per cent infrastructure is already ready. Some developers deliver affordable housing in areas which will take 5 to 10 years to develop. Jewelz will be delivered by September 2020,” Sajan informed. The developer aims to deliver 4 projects this year worth Dh1.5 billion and spanning 1,400 units. It will also open 3 offices in Oman, Kochi and New Delhi this year. Talking of project progress, Rahman said utilities have been connected for the Dreamz townhouses in Al Furjan and handover will commence soon. Danube is the process of securing completion certificates for Glitz 3 in Studio City. The developer currently has 6 million sqft under construction in Dubai. “There is big demand for affordable housing. How many developers that launched are actually delivering units? Not more than 15,000 units are being delivered every year. Rentals are still robust in the affordable housing segment,” observed Sajan. He also suggested investors and end-users to buy Dubai property now before prices rise after Expo 2020. “Dubai property is not here just for Expo 2020. Property prices in Shanghai skyrocketed after the city hosted the Expo because of global awareness. Dubai will see the same phenomenon. Prices will go so high that today is the right time to buy Dubai real estate,” he concluded.